Title: Why do protoplanetary disks appear not massive enough to form the known exoplanet population? Planets form from the dust and gas in protoplanetary disks, so we expect that the mass of these disks must be at least the same as the mass of the resulting planets. As this process takes millions of years, we cannot watch a given disk form planets. So the authors of today’s paper compare young protoplanetary disk masses with the masses of exoplanets that have already formed. The authors used all confirmed exoplanets with stellar and planet masses. 80% of exoplanet masses were directly probed using the radial velocity technique, which gives a minimum mass (M sin i, where i is planet inclination). They used protoplanetary disks from the two youngest star-forming regions (1-3 Myr old) extensively studied with ALMA. ALMA measures the amount of flux at millimetre wavelengths beyond 10 AU. By assuming a disk temperature and an optically thin disk at these wavelengths, they can calculate the dust mass of centimetre-sized grains. The total mass of the disk is calculated assuming the gas has 100 times the dust mass (represented in yellow in Figure 1). Stellar luminosities combined with distances from Gaia DR2 were used to estimate stellar masses. To try make it a fair comparison, the authors compare the masses of planets and disks as a function of the mass of their star. Low mass stars with < 0.3 solar masses have mainly rocky planets (i.e. < 10 Earth masses) when in multiplanet systems. Figure 1 shows the median mass of dust in protoplanetary disks is just 20-30% of the total mass of exoplanets around low mass stars. In fact, even the top 10% of disk dust masses are about the same mass as the median planet system mass. Figure 1: Mass of disk or planets as a function of stellar mass. Masses of single exoplanets are shown by green circles and blue diamonds represent the total mass of planets in known multiplanet systems. Disk dust masses are shown in red (with empty circles representing the Lupus region and empty squares for the Chamaeleon I region). The same disks are shown in yellow, but with the disk mass x 100 to indicate the total mass. Right: Coloured regions contain the 10th-90th percentiles and dashed lines represent the median. Figures 1 and 2 from today’s paper. 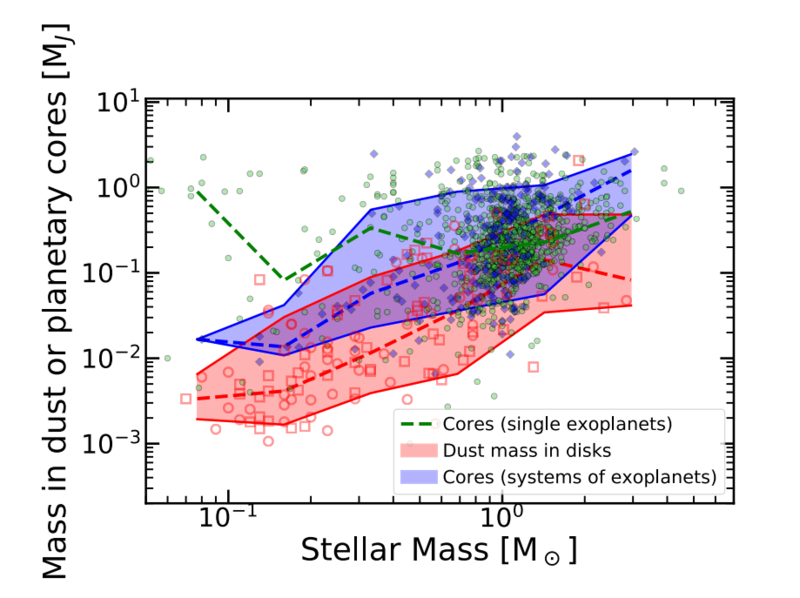 To investigate the full range of stellar masses, the authors compare the disk dust masses with the core masses of the planets in Figure 2. Core masses represent the fraction of a planet’s mass which is rocky, and are calculated from models which use the density (found from the total mass and radius) to constrain its gas to heavy element ratio. This is a better comparison than extrapolating the total mass of the disk. Figure 2 shows that the median disk dust masses are only 20-30% of the median exoplanet masses for stellar masses up to 2 solar masses. Comparing disk and core planet masses assumes that nearly all the dust grains available for accretion are up to 1cm in size, where ALMA is sensitive to. There is little dust within a few AU where planets are found, so their presence means either they migrated or were produced by accretion of pebbles larger than 1cm. Figure 2: As in Figure 1, except planet masses show the core mass of single planets in green and the sum of the cores in multiplanet systems in blue. Figure 3 from today’s paper. These results suggest that the dust masses in 1-3 Myr old disks are lower, or at most comparable to, the amount of heavy elements in exoplanet systems. Clearly, the extra mass has to come from somewhere unless our measured disk dust mass or planet formation theory is wrong. The current pebble accretion theory is very inefficient, with only a small fraction of available pebble-sized dust clumps actually becoming part of the growing planet. To form the 20 Earth-mass core of Jupiter, required 350 Earth masses of pebbles to accrete onto a rock half the size of our Moon. From planet formation theory, the authors assume that the vast majority of heavy element mass in the disk are pebbles up to 1 cm in size as measured by ALMA. However, if a significant fraction of the material is already in pebbles larger than 1cm then true disk dust masses could be more than ten times larger. If most of the material is already in planetesimals or planet cores, then these could have formed when the disks were younger than their 1-3 Myr and more massive. However, the faint CO emission lines – a tracer for disk gas – suggests that the gas to dust ratio is much lower than the 100:1 ratio in the interstellar medium, requiring a very efficient gas removal mechanism. Alternatively, disks could be replenished by new material from the interstellar medium. The total amount of gas and dust available while the planet is forming would then be much greater than the amount of dust mass observed at any given time. However, it remains unknown how many disks actually accrete from the interstellar medium, and whether this is continuous or sporadic. To solve the mystery of planets appearing heavier than the disks, we need to push measurements of disk dust masses to younger disks where it is even less likely that planet cores have formed, and even to ‘embedded’ disks, where the disk itself is still forming. Observers will also have to revisit their assumptions in calculating disk masses. If we can also measure how many disks are replenished with material from the interstellar medium, that could confirm whether this is a viable mechanism for increasing the dust available for forming planets. I am a PhD student at the University of Warwick. My project involves searching for transiting exoplanets around bright stars using telescopes on the ground. Outside of astronomy, I enjoy rock climbing and hiking.